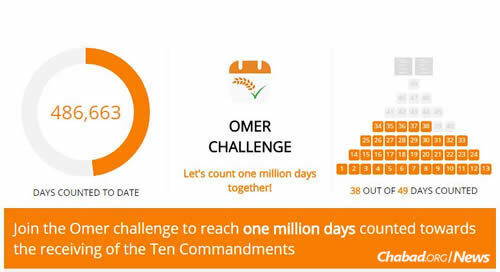 Chabad.org just launched the “Omer Challenge,” encouraging people to count the Omer and inspiring others to do the same by posting their activity on social media. When Tyler Scholl downloaded Chabad.org’s new “Omer Counter” app just before Passover, he knew he found a winner. The app helps users fulfill the biblical commandment to count the 49 days between the Jewish people’s departure from Egypt on Passover and their receiving the Torah at Mount Sinai on Shavuot. Within a few days, Scholl shared the app with his circle of family and friends, who now use it regularly and have shared it with others as well. 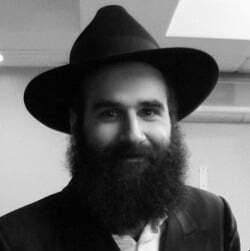 “Through organic sharing, this app has, thank G‑d, reached a very broad cross section of the Jewish people,” reports Dov Dukes, lead app developer at Chabad.org. A little more than four weeks into the Omer count, some 487,000 days had been counted, leading Dukes and his team to realize that reaching a million individual “countings” via the app was a real possibility. The app helps users fulfill the biblical commandment to count the 49 days between the Jewish people’s departure from Egypt on Passover and their receiving the Torah at Mount Sinai on Shavuot. To that end, Chabad.org just launched the “Omer Challenge,” encouraging people to count the Omer and inspiring others to do the same by posting their activity on social media. Using completely anonymous data, the app’s engine automatically keeps track of aggregated Omer counts and then updates the live counter accessible from the app, as well as on an expressly dedicated webpage. The campaign also seeks to educate people that even if they missed a full night and day (or more), they can and should still count nightly until the end of 49 days (albeit without saying a blessing). The “Omer Counter” app is part of Chabad.org’s Jewish Apps Suite, which strategically leverages Chabad.org’s content and know-how to make Jewish information and observance accessible on other platforms. Through the vision and generosity of a group of funders, the Omer counter app joins the “Hayom” app (now available for the Apple Watch), the “Passover Assistant,” the “Jewish.tv” video app, the “Shabbat Times” app, a JewishKids.org app for children and others—all designed to help bring Jewish wisdom and tools to the fingertips of users. Additional apps are in the planning and developmental stages by an international Chabad.org team. The drive, vision for and underwriting of the apps, which are available free of charge, come from the generous partnership of Dovid and Malkie Smetana, Alan and Lori Zekelman, the Meromim Fund, and Moris and Lillian Tabacinic—all dedicated to spreading the wisdom and practice of Judaism worldwide. Read more about the “Omer Counter” app here. A complete list of Jewish apps from Chabad.org can be found here. Download the “Omer Counter” app for your Apple device here or Android device here.